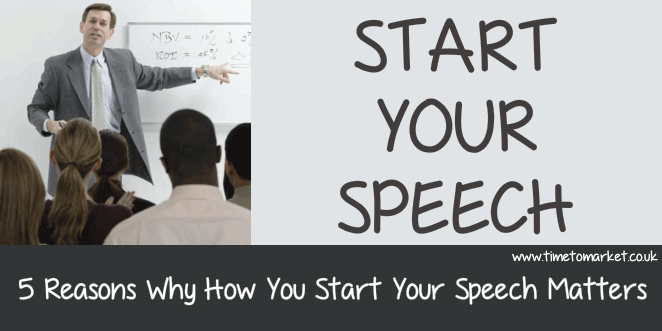 How you choose to start your speech really does matter. That’s because a good speech has a good opening. It’s true that an excellent start to your speech doesn’t guarantee success but a bad opening comes close to guaranteeing a bad speech. Your opening remarks matter. You have some 90 seconds when you start your speech and have the full attention of your audience. They want to know more about you. And they also want to know why you are qualified to speak to them today. And you also want to gauge their receptiveness to you and your ideas. So after a minute and a half you need to earn their attention. Earn their respect. Use your “grace” period. Take advantage of the time when you have your audience’s full attention. This is not long. Assume that you have 90 seconds and no more in which to seize their attention and then keep it for the rest of your speech. Set common ground. Use your speech opening to set out the shared connections, associations and interests that bind you to your audience. This is important when you need their support and engagement later. You have a good example of this in the President Obama Osawatomie speech. Set the tone. Your speech’s opening should set the tone for everything that follows. That, of course was obvious with the David Cameron Indonesia speech after the Aceh earthquake. However, If you want a relaxed, informal presentation then your opening comments should be informal and, perhaps, humorous. Highlight your qualities. Aim to use your speech opening to highlight why it’s you who is speaking today. Then, show your expertise or unique status on the subject. But take care not to sound egotistical or self-obsessed. Self-flattery is not a good opener. Build interest. Your speech opening should generate interest and anticipation for more details and observations from the rest of your speech. How you choose to start your speech really does matter, so here are 5 reasons why you should start with some planning. Take advantage of your grace period at the beginning. Your audience is on your side…for the moment. Set common ground with your audience and they will reciprocate. Aim to set the tone for everything that’s going to follow. Highlight all your qualities as a speaker. Build interest for the rest of your speech. Your opening remarks need to achieve at least one of these objectives. And you should, ideally, aim to achieve several in the 90 seconds of “grace” period that you have available. When you achieve these you have the best possible opportunity to retain your audience’s attention for the rest of your speech. You can find out more about how you can start your speech with style when you join a public speaking training course at one of more than 40 UK training venues. So, when the time is right, please don’t hesitate to get in touch.